Camberwell is a residential suburb 9 km east of central Melbourne, between Hawthorn and Burwood. Until the 1850s the area was occupied for grazing, being described as ‘light sandy country, timbered with gum and oak’. Roads were rudimentary, but at one point three roads intersected, and in 1853 an inn was erected at one of the corners. Its owner recollected that several roads converged at Camberwell Green, London, and he called it the Camberwell Inn. The intersection, known as the Burke Road or Camberwell Junction, is on the western boundary of Camberwell. All the district adopted the name of the inn. As well as being suburban Camberwell was Sabbatarian. All major denominations had large followings. The local Council turned its face against noxious industry, houses on small allotments and advertising billboards. The community had a strong temperance movement which in 1920 succeeded in carrying a poll of residents for the closure of hotels and wine saloons The Camberwell lnn was replaced by a milk bar. At about that time more subdivisions were under way along the routes of recent tram lines along Riversdale and Burke Roads (1916). Camberwell's tallest buildings included four churches visible from miles away. In Riverdale Road there are the Catholic St Dominic's on a hill top and Trinity Presbyterian. Trinity's minister from 1887-1928 was Keith Murdoch's father. In Burke Road there is the basilica-like Our Lady of Victories and the Anglican church, both near the junction. All are a testament to Camberwell's wealth and religiosity. The main street shopping centre along Burke Road became a complete strip from the junction to the railway and has continued to dominate the district's retailing. Land behind the Burke Road strip was acquired for parking, a supermarket and discount department store in the 1960s. In the 1990s similar development occurred behind Burke Road on the other side, in Hawthorn. Right at the junction, on the Hawthorn side, high-rise apartments were completed in 2012. The area's housing is in good condition. Large blocks which are redeveloped may have a modern (usually two-storey) house duaI occupancy, or units if near a public transport route. In the older (western) part of Camberwell are a few neighbourhood reserves and the football and cricket oval, whereas the later (Hartwell and Willison) areas have more reserves, a number of which adjoin water courses. 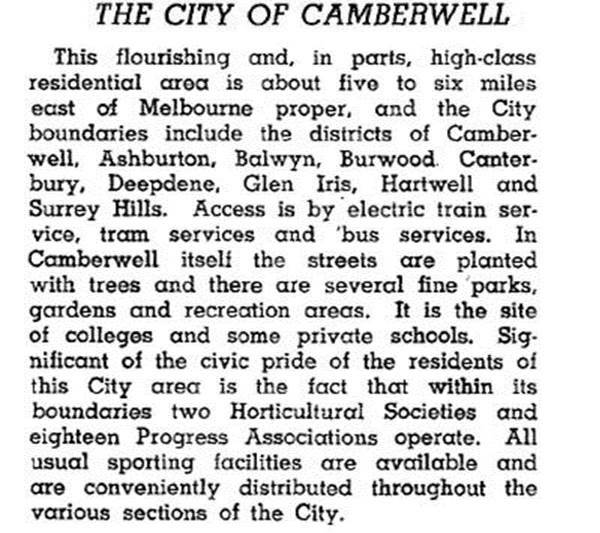 The Camberwell high school (1941) is near the East Camberwell railway station. Camberwell was also a municipality of 36 square km, bordered by Burke and Warrigal Roads on the west and east, the Yarra River on the north and Gardiners Creek on the south. Originally Boroondara shire (severed from the Boroondara District Road Board), on 17 November 1871, it became Camberwell and Boroondara shire (1902), then a borough, Camberwell town and finally a city on 20 April 1914. The municipality's earliest areas of urban settlement were along its public transport lines, particularly the Camberwell to Box Hill railway line. In the north of the municipality were Balwyn, Balwyn North, Deepdene and Greythorn. Burwood, Canterbury, Hartwell, and Surrey Hills occupied the older middle area, and in the south were Ashburton and Glen Iris. By the 1980s and 1990s Camberwell had a higher than average aged population, with redevelopment of older housing blocks occurring as aged residents departed. The median housing price in the Camberwell municipality were above the metropolitan average – 52% higher for houses and 30% higher for flats in 1991. In Camberwell itself the median house price in 1987 was double the metropolitan median, and in 1996 it was 217% of the metropolitan median. Open space was 8.7% of the area of the municipality. In 1990 there were 30 government and 36 non-government school campuses in Camberwell, and the proportion of non-government school students was 19% higher than the metropolitan average. Camberwell has several heritage-listed buildings: Broughton Hall (1858), Premier O'Shannassy's residence, now a nursing home, Church of Christ Scientist (1937), police station and court house (1939), and Robin Boyd's house, 664 Riversdale Road (1947). In 1992 the Council entered into a contract for redevelopment of land at the rear of the Burke Road shops. Strong resident reaction led to a re-elected Council repudiating the contract and having damages awarded against it. On 22 June 1993, the Council was suspended and replaced with a Government appointee. During this term of office the CounciI was amalgamated with Hawthorn, and Kew cities, which avoided the State Government's preferred option of splitting Camberwell and amalgamating the parts with other Councils. Boroondara city came into effect on 22 June 1994, and occupies an area approximating the original Road Board District. In 2000 Camberwell absorbed a part of Burwood west of Warrigal Road, and the change is reflected in the population recorded in 2006. Boroondara Council became one of the first in the country to ban smoking in public places in 2012, when it banned smoking in playgrounds, bus and tram stops, sports grounds and all council buildings in Camberwell.